In her 2015 State of the District held on February 18, Council Member Julissa Ferreras announced the delivery of four major housing, economic development and education projects that will ensure members of the community have all they need to live, remain and thrive in District 21. In her role as chair of the Council’s Finance Committee, she also made a commitment to fight for additional funds for the emergency room at Elmhurst Hospital, improved mass transportation in New York City and the establishment of the Flushing Meadows Corona Park Alliance. Construction of the first affordable housing development in District 21 is set to begin at the end of 2015 and expected to last 18 months. As part of the Willets Point deal Council Member Ferreras negotiated in October 2013, all 67 rental units in the building, which will be located at 54-25 101 Street in Corona, will house low-income seniors. The ground floor will include the co-location of an early childhood development center serving children 6 weeks to 5 years old. Amenities and services that will allow seniors to age in place will include a rear garden, a community area and medical referral services on demand. Applications are expected to become available in early 2017 and will give seniors living in District 21 priority. The Sunrise Auto Coop and Economic Development Corporation are working towards finalizing a $5.8 million agreement that will relocate auto shops that rented space at Willets Point to a brand new, safe and well-equipped work and business space. The new complex at 1080 Legget Avenue, off of Interstate 278 in the Bronx, will provide office space and proper storage for paint and materials among other features. A request for proposals for the construction is scheduled to be released by the Coop later this year. Members of the community and the 82nd Street Partnership are near to reaching an agreement that will expand the Partnership from 82nd Street to 104th Street along Roosevelt Avenue to create the Corona-Jackson Heights Business Improvement District. The agreement will ensure unprecedented community representation in the new BID to match the vibrancy of Roosevelt Ave while bringing safety, enhanced cleanliness and business services to shops in the area. In addition to the establishment of a one of a kind BID for Roosevelt Ave, Council Member Ferreras announced the installation of new lamp posts and LED bulbs this year; the establishment of a small business task force for all businesses in LeFrak City, East Elmhurst, Elmhurst, Corona and Jackson Heights; and her strong support of what would be the first Latina immigrant transgender cooperative in the nation, formed by residents of District 21. In a $10 million project with Queensborough Community College and Urban Health Plan, District 21 will be the home of a 19,000 square-foot higher education and health care institution. The facility will provide training and clinical rotations in such high-demand medical professions as nursing, phlebotomy and medical assistant; as well as affordable primary and specialty health care for members living in the community. Further, the partnership will expand access to healthcare related educational opportunities through Queensborough’s articulation and dual/joint programs with York College, the School of Professional Studies and Queens College. In addition, Council Member Ferreras announced the opening of P.S. 315 this year, which will add 640 public school seats to the District. The construction of this and several other schools as well as the expansion of P.S. 19 and P.S. 92 came after years of advocacy by the Council Member and her Education Task Force that brought together Make the Road New York, La Fuente, Community Education Councils 24 and 30, the Department of Education, school principals, teachers and parents. Next, the Council Member promised the Education Task Force would demand the immediate removal of trailers from P.S. 143. In the months and years ahead, Council Member Ferreras made a commitment to firmly advocate for improvements to services that make District 21 a popular place to live. Council Member Ferreras highlighted the $11.1 million gap the City has left to fund for crucial emergency medical care at Elmhurst Hospital, the primary trauma receiving hospital in Western Queens. With over 150,000 emergency room visits a year and an open-door policy for undocumented immigrants, Elmhurst Hospital is in desperate need of 10,000 square feet of new space, double the number of treatment bays and 5 additional isolation rooms. As part of her budget negotiations, Council Member Ferreras promised she would not rest until Elmhurst Hospital had adequate funding for the upgrades it needs. With $26 million in private and public commitments already made to invest into District 21’s iconic park, Council Member Ferreras plans to hold the Mayor’s Office to its promise of establishing by spring the Flushing Meadows Corona Park Alliance. The Alliance, composed of the Mayor’s Office, City Council, Queens Borough President’s Office, Community Advisory Board, Parks Department and local civic and community leaders, would be a guardian of the park, protecting its historical significance, green space and community programming. Council Member Ferreras will introduce legislation this year to end the sanctioning of benefits when someone misses an appointment with the Human Resources Administration. Presently, the HRA will cut benefits like food stamps, health insurance and public assistance when a person misses an appointment. This practice does not consider difficulties finding childcare or elder care, disability or demands at work and forces low-income New Yorkers to go weeks or months without the support they need to survive. Council Member Ferreras plans to work with the State, Metropolitan Transit Authority and workers unions to make the purchase of transit fare more convenient for all New York City residents. Her proposal would enable commuters to view their balances and refill their MetroCards online. Currently commuters may only purchase MetroCards at station vending machines, some convenience stores or, under specific circumstances, online monthly. 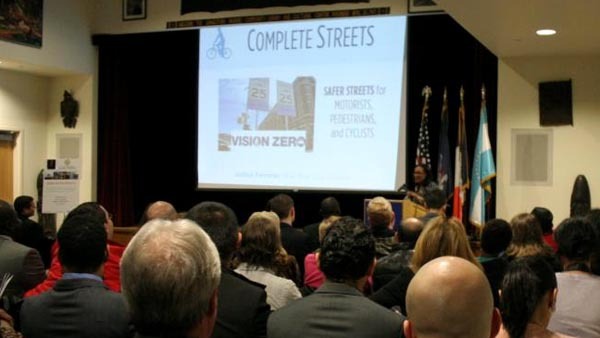 In addition to this legislation, Council Member Ferreras said she would bring more Complete Streets to the heavily transited Astoria Blvd and 111 Street; and continue to push for improvements by the MTA, Port Authority and the Governor’s Office for East Elmhurst bus service and the 7 line at Willets Point. “The Urban Justice Center works to protect the rights and strengthen vulnerable communities. The Sunrise Auto Coop deserve a space where their businesses can prosper, be safe and have the support networks they need,” said Harvey Epstein, associate director for the Community Development Project at the Urban Justice Center, the Sunsrise Auto Coop’s legal representative. “It has been a pleasure to work with the Council member and other community representatives in the drafting of a community agreement that will guarantee equal representation now and in the future,” said Leslie Ramos, the executive director of the 82nd Street Partnership. Ms. Ramos, who took the position in October, has met with dozens of the area’s small business owners to get the full spectrum of services they need. “Elmhurst Hospital’s doctors are some of the best in the city with expertise in level one trauma, cardiac care and women’s health. An adequate emergency room to match the quality of service is something this community needs and deserves. We thank Council Member Ferreras for standing by the side of the community and the Hospital to move the City to fully fund the upgrades we need,” said Christ Constantino executive director of Elmhurst Hospital Center and senior vice president of the Queens Health Network.